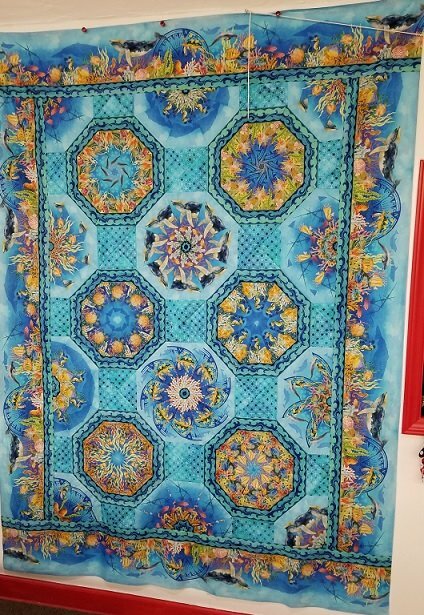 We will be making a Twin size octagon kaleidoscope quilt using In The Beginnings Calypso border print & 1 other fabric. The repeat on the print is 36" and all 4 stripes are the same. The quilt is stacked and cut different than we have done before. The blocks are 16" and go together quickly once cut. They are beautiful! If you have never done a stack-n-whack now it the time! We will make the quilt in two sessions, the first to make the blocks and the second to put your quilt together. See the finished top in the shop! Requirements: Sewing machine, standard sewing supplies. You will need a 24" ruler to cut the stripes apart and the kaleidoscope ruler to cut the blocks. The fabric kit includes 10 yards of fabric for the top and the pattern. We have enough fabric for 4 students. If we have more interest we will order more fabric and hold another class. Instructor Bio: Rikki has been quilting for almost 25 years. She began sewing as a young child making doll clothes and did garment construction until she began quilting. She is the owner of the Ladybug quilt shop.